Frisco biking gives the rider many options from cycling on the Frisco paved bike paths connecting 5 different towns with scenic mountain views. 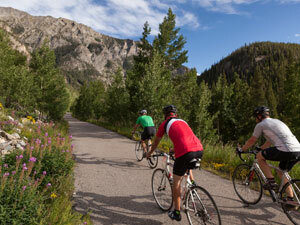 Frisco mountain biking gives you the thrill of riding on established trails through the mountains of Frisco. Take a Frisco guided bike tour or rent a bike. From street to mountain bike or get a fat tire bike both in the winter or summer in beautiful Frisco. In the summer, we change over to renting, repairing, and retailing bikes. We also offer discs for disc golf, rental bike sales, and a full line of accessories. We set ourselves apart from the rest by offering the best customer service and best equipment possible.